January Magazine has included my young adult book The Ice Dragon on its annual list of gift books for children, with a lovely review. If you’re looking for a last minute Christmas present for the young people on your list, you can check out January‘s entire list. And Booksense, the magazine of the American Booksellers Association, has also included The Ice Dragon on its Winter list of “Children’s Picks.” You can check out their entire list. My thanks to both magazines for the recommendations. 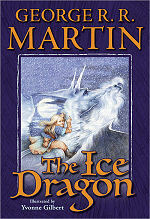 Starscape, the young adult division of Tor Books, released the YA hardcover edition of The Ice Dragon in October 3. Beautifully illustrated by the British artist Yvonne Gilbert, the book debuted at #6 on the New York Times children’s bestseller list, and remained on the list for a second week at #7. For those who like to listen, Starscape has also released the story as an audiobook, read by the talented Maggi Meg Reed. The Ice Dragon has been a personal favorite of mine, ever since I sat down to write the original version back in 1979, in a snow-bound house in Dubuque, Iowa, so it’s a great thrill to see it finally getting some notice. My thanks go out to Yvonne Gilbert, to my editor Wanda June Alexander, my agent Kay McCauley, to Kathleen Doherty and Linda Quinton at Starscape, and to everyone else who helped make this possible.